My total has not moved since 20 December, but I have. I've spent Weihnachten / Christmas in Northern Germany, and now I'm in Florence for Anno Nuovo / New Years. I'll be in Rome and Cairo for my birthday (I wonder if any customs officials will wish me happy birthday? ), Honduras for Waitangi Day, and probably Argentina for Easter. I haven't arrived at any New Year's Resolutions for 2009 yet as I'm still getting over 2008's. From 2 January to 22 March 2008 I was ahead of target. Those were the days. The blue flatlining at the end of the year is a bit depressing / misleading. I recommend you focus more on the steepness of the section that just precedes it. 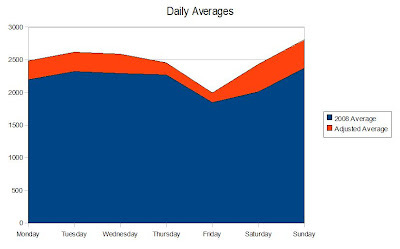 By taking out all the days I was away from home, Sunday clearly outperformed the rest (adjusted average of 2,807 words versus Tuesday's 2,619). But it would be remiss of me not to address the fact I was aiming for 1,000,000 words and not 800,000. As Mike LaFontaine would say, Wha' Happened? But travel wasn't the whole story. 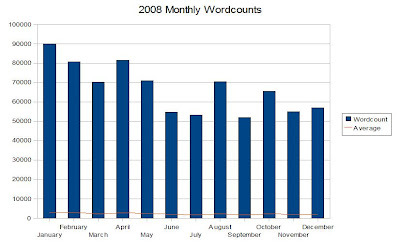 There were 43 goose eggs in 2008 (days when I wrote no words) - - all travel related. But if I had those 43 days again, I'd still need to write around 4,600 words a day to crack the million. 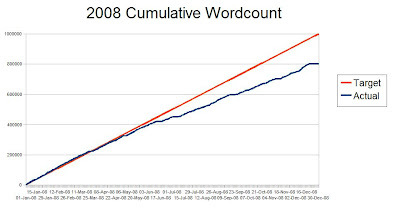 The longest span over which I averaged that many words was eight days => Verdict: unlikely. There was, of course, the dreaded day job to contend with. Or day jobs. After an extended Christmas break, I started a six-week temp job in mid-Jan. Queue first drop-off. Then, in March, I moved straight into a more difficult job. 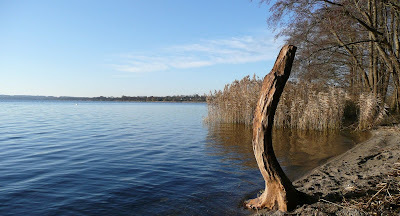 I still spent the same amount of time away from home, but I was left with much less energy in the evenings (and less time to dream up things to write about while filing...). But travel and employment aren't really excuses. I don't regret the places I've been or the money daytime drudgery has earnt. I always knew writing had to fit in around life: the Quest For A Million Words came about as a way of shifting writing up the list of priorities (however artificially), and in that respect it was a success. My inability to commit to, and finish, a novel-length narrative. Perhaps it was due to the pressures imposed by this scheme (which I devised to force me to finish another novel). 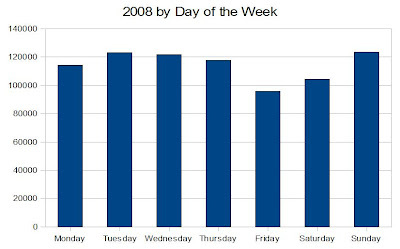 Perhaps it was the difficulty inherent in writing a novel in evenings and weekends? (If and when I jump back on that Clydesdale, I'll look long at hard at doing it without working a day job). Or perhaps I wasn't ready to write another novel? Perhaps I'm just not built for them? I don't regret any of the time I spent on poetry or short fiction, so I cant turn around now and say I wish I tried harder with Novel A and Novel B. They'll still be there when I'm ready. Blogging is a rather large constituent. 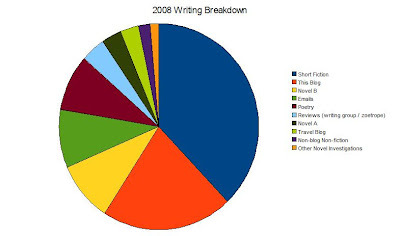 I expended about as many words writing about my travels for friends and family on my travel blog as I did on Novel A. I probably didn't put as much care and attention into those posts as I did in my rock'n'roll novel rewrite, but when I read over some of the 'improvements' I thought I was making to the novel, I was clearly way off base. On the other hand, when I read over some of my travel blogs, I don't cringe as much as I would suspect (typos aside), and find that without churning out 2,000 words of "We did A, then went to B, then had C for dinner..." I would have forgotten some details which might one day wriggle their way into my fiction (or poetry). The moral: travel blogs (and update-type emails, see larger green segment) contain some value and deserve to be included in the word count. As for blogging here, sometimes it has been a postive, sometimes a negative. 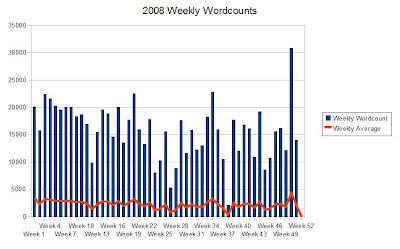 The weekly wordcount updates helped push me along, but sometimes it all felt a bit too public. I'm liked having a place to air my thoughts about short story competitions, or the evolution of my musical tastes, or nuwanubianism... but wonder now if there shouldn't be a cooling off period before some things get posted, and an expiry date after which some posts cease to exist. And since this blog, with it's quest-y title and optimistic and soon-to-be-outdated url, is so 2008, I have a decision to make: continue to blog here, create a new blog (with another gimmick? ), or lapse into silence...? It's a decision I am yet to make. For now, the Quest For A Million Words remains open. I will appear at random intervals to post photos and perhaps even anecdotes from my travels. When I have a job and a place to live back in New Zealand, and have sent of the final manuscript for my short story collection (title still to be determined), things should be clearer.